^ He was raised a Southern Baptist. (= a member of the Southern Baptist Convention SBC). Clinton left the SBC due to disagreement with its conservative positions (details here). See also: New Baptist Covenant. 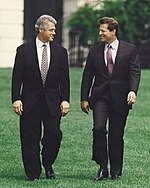 ^ whitehouse.gov -- April 2, 1999: The Longest Peacetime Expansion in History. clinton4.nara.gov. [2015年5月11日]. （原始内容存档于2011年6月9日） （英语）. ^ Library of Congress - House Report 105-648 - DEPARTMENT OF TRANSPORTATION AND RELATED AGENCIES APPROPRIATIONS BILL, 1999 （英语）. ^ Clinton Accused - Special report.. [2015年5月11日] （英语）. 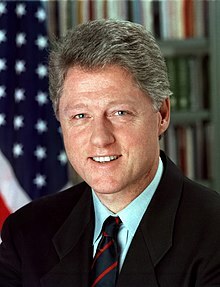 ^ Biography of William J. Clinton. 白宮. [2015年5月11日] （英语）. ^ President Bill Clinton's Hometown Homepage. [2007-02-01] （英语）. 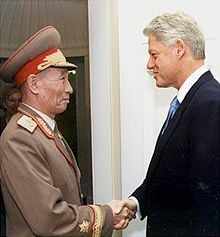 ^ Clinton, Bill. My Life. Knopf. 2004-06-22: 52 （英语）. ^ It All Began in a Place Called Hope. [2007-01-02]. （原始内容存档于2011-07-19） （英语）.